An emotional Hallberg during bows after a performance of "Giselle" last May at the Metropolitan Opera House. Photo by Kent. G. Becker, Courtesy Simon & Schuster. 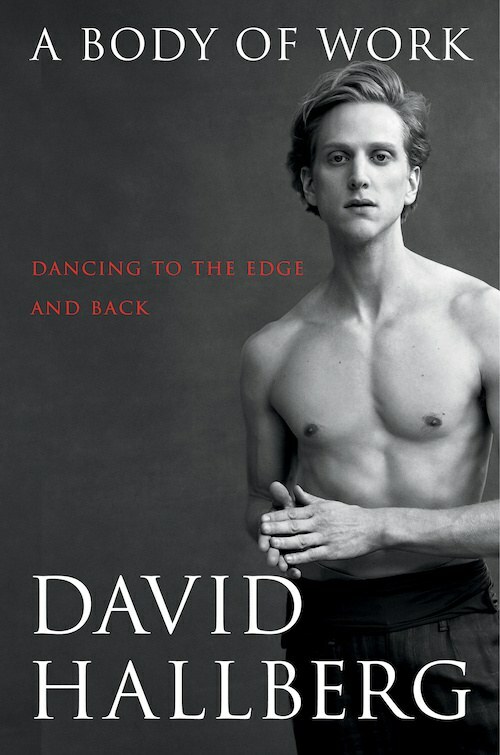 On November 7, David Hallberg's highly anticipated memoir, A Body of Work: Dancing to the Edge and Back, will be available in bookstores. (It's currently available for pre-order from Simon & Schuster and various other retailers.) Published by Touchstone Books, the autobiography details Hallberg's arduous recovery from a series of career-threatening injuries, and his triumphant return to the stage. Marina Harss spoke with the American Ballet Theatre principal about how his experience has changed him, his future with the Bolshoi and his desire to someday direct a company. The initial seed was planted by New York Times dance critic Roslyn Sulcas. This was way before the Bolshoi. She just said you're traveling a lot now. You know, maybe just start to jot some things down about your experiences. So I took her advice, and then Simon & Schuster called and expressed interest in a book, and I dove in headfirst. The focus of the book must have changed a lot after the injury. Absolutely, and to be honest, the book had no backbone before the injury. It was "dance memoir 101." Not to say I didn't have a story to tell. But the meat of the book and for me, the heart, and soul, and the gut, is the nightmare that I went through with the injury. As I was reading the book it felt almost as if you were a survivor of some kind of trauma. It was emotionally traumatic. It was physically traumatic. It was mentally traumatic. Everything unraveled, and everything went wrong. How has the experience of being away from the stage for two years, and coming back from a series of potentially-career-ending injuries changed you? I see things more holistically. It's really not just about the self and the ego anymore. I'm more compassionate, and I know that when something comes my way, I can live through it. I'm a lot more aware of everything around me, of who I'm partnering, of portraying a character, of boiling it down to who I am within a given framework. Hallberg backstage with ABT's physical therapist, Peter Marshall. Photo Courtesy Simon & Schuster. You talk a lot about the ego in the book, and in your profession you need a healthy ego. So how are you going to reconcile this new outward focus with the ego that goes with being an artist? One thing I haven't lost is my ambition. It's never good enough. There's always something to discover. When I step onstage as Albrecht or in a new ballet, I do so wanting to discover the experience, using what I've been given and my years of experience. But the sour part of ego, that's when things spoil and when the goal is compromised, and it becomes about something more fickle than artistic fulfillment. It seems that one thing that led to your injury is overwork. Have you learned to say no? Absolutely. I revel in preparatory time, in being afforded six weeks to prepare for the fall season as opposed to coming in two weeks before and doing repertoire that I already know so I could just throw it onstage and say I've done a full season. I don't have to run around like crazy. It doesn't make me feel good anymore. Another important theme in the book is loneliness. Is it something inherent in the profession? Or is it more about who you are? It's the loneliness of the path I chose. I chose to travel a lot. I chose to accept these invitations. I chose to put myself in an environment where I knew no one and didn't speak the language. It's more who I am than about the profession. I go to Australia, and there, it's this inclusive environment. The dancers are so beautifully taken care of. They all go through their entire school and professional lives together. It's this environment that's very protective, and you feel this connectivity with everyone around you. I had the opposite, and so I guess it's what I crave as a person. You crave it? It sounds like a double-edged sword. Yeah, it's difficult, but I've learned that I get bored if I don't have those challenges. I love the difficulty of saying I'm going to Moscow alone. How exciting. How scary. Or, I'm moving to Paris. I don't speak the language. I know no one. I'm buying a one-way ticket, and I'm moving to Australia for I don't know how long to see if strangers, essentially, can save my career. Those experiences are who I am. Hallberg with Evgenia Obraztsova in "Onegin" at the Bolshoi Ballet. Photo by Batyr Annadurdyev, Courtesy Simon & Schuster. Are you going to go back to the Bolshoi? You haven't made plans yet? You write very movingly about what it felt like to dance Giselle and Romeo and Juliet with Natalia Osipova. And how bewildering it was when she left the Bolshoi, where you had hoped to dance with her. It has recently been announced that you will be dancing Giselle with her next year, at ABT and the Royal Ballet. Have you been in touch? I have. It makes me emotional. Was that the ultimate experience for you? It was. That's why I dance. To experience what we had, not just what she gave me, but what I gave her, what we give each other. How have you changed as a dancer? It's a constant evolution. I feel like physically, I'm more earthbound. I've restructured my entire instrument, and it has more weight. I carry myself differently because I have a lot more to support myself with. You had help on the physical side, but was the rest of it, the mental healing, up to you? Well, one of the branches of the rehab team is a sport psych. So I would see a sport psych every week, just mentally get me through the process. But I have to say, as much as it helped seeing a sport psych and as vital as it is going through an injury, it was the moments of just sitting in the park drinking beer, and smoking, and just, being alone that really…. Those were the most productive moments. Hallberg and Australian Ballet principal Amber Scott. Photo by Kate Longley, Courtesy Simon & Schuster. Now that you've gotten so close to losing your dance career, can you imagine a life after ballet? Absolutely. I still think about it daily. I was this close.... I was about to step over the edge and go into another life. I know my passion as a dancer is so crystalized because of what I went through, but my passion for what I want to give as a non-dancer is even more crystalized. That was part of the process, as well. I know what it tastes like. I'm not scared of it at all. You know, I feel so empowered to give to this art form as a leader. I can see where it is now, and I want to drive it forward. The most obvious thing would be to be a director of company. I feel so impassioned about leading dancers and taking what I've been given in my career around the world and applying that to an institution. I've always had an interest in that, but eventually, push will come to shove, and I will hopefully find an institution that I believe in and that believes in me, and I'll be so ready.